I served as a Fulbright Fellow for the fall semester of 2000 through the end of the spring semester of 2001 in St. Petersburg, Russia. Although I applied for a teaching fellowship, I included scholarly plans in my application and I conducted research while serving in Russia. I found the application process pretty straightforward. My impression is that they are looking for scholar-teachers who have a great interest in travel and other cultures. I also believe that (at least when I applied) they were interested in people who were flexible and willing to adjust to the dynamics of other places and peoples. Finally, I think they value people who are interested in a true exchange, who are not only interested in learning something new but in sharing alternate ways of being, thinking, and doing with others. My teaching (especially of argumentation and debate) and my scholarship (which involved ethnographic interviews) required my student and faculty hosts to adjust their thinking about higher education and research. However, I also took great care to learn from them and to absorb and appreciate the culture that surrounded me. My primary assignment was at St. Petersburg State University in the Department of International Journalism, although I am more a rhetorical scholar than a mass media or journalism scholar. I was not able to secure a sabbatical from my home institution because the application process at my campus was so different from the Fulbright application process. However, I was able to get educational leave without pay and health insurance through COBRA (the cost of which was reimbursed by my institution when I returned). I deducted all of my work-related living and transportation expenses and as a result paid less in tax than I normally would. My wife quite her elementary teaching job and joined me on the trip. In the end, the trip reduced our income but it was definitely worth it. I rank my experience as a Fulbright Scholar the third most significant experience of my life (behind my education and my marriage/children). There were plenty of challenges during my time in Russia and some strange miscommunications, but it was all part of the rich variety of experiences I had during that year. 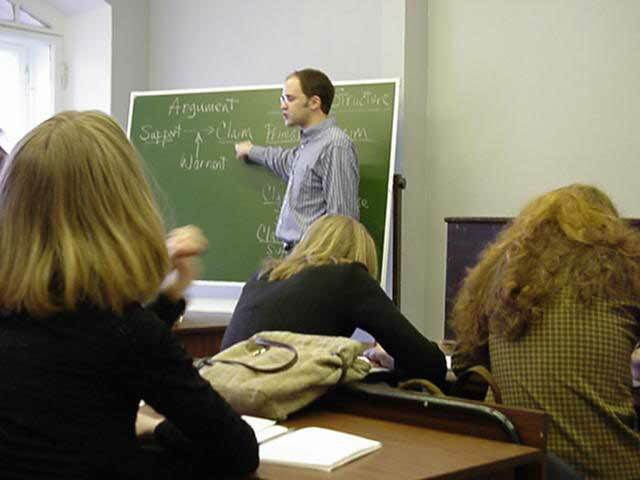 As a result of connections with the state department and various educational and cultural organizations, I had the opportunity to teach in many cities outside of St. Petersburg. I taught college students, high school students, journalists, other college faculty, elementary and secondary teachers, and community members. I taught in gymnasiums, churches, public libraries, community centers, hotels, and (of course) college buildings. I enjoyed a great deal of travel by train to countries including Finland, Sweden, Estonia, Latvia, and others. I also received a Fulbright-Hays Fellowship to Ghana, but that is a whole different story. It was a month-long study trip, so I was more a student and researcher than a teacher. But it was an awesome experience as well! I encourage anyone to consider applying.